The Beacon Regional Review Team – Helping Families Overcome Challenges. Each month, the Beacon ABA Services staff for each region holds a Regional Review Team (RRT) meeting. These meetings are important for our staff and our families as it provides a means for our staff to be able to discuss, and provide recommendations and support for clients whose progress has become hindered or has become more challenging or dangerous. 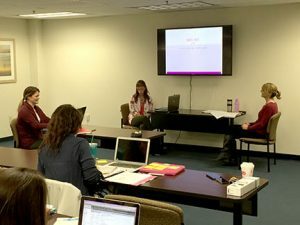 It is also an opportunity for our Behavioral Therapists (BT), Associate Behavior Therapists (ABT), and our Board Certified Behavior Analysts (BCBA) to receive additional training in how to apply evidence based strategies to a specific client’s case. 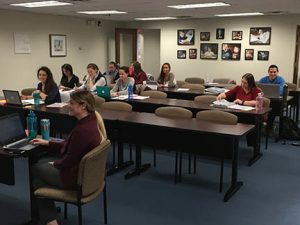 The RRT is comprised of Beacon employees starting with a doctoral level BCBA (BCBA-D), the regional Associate Vice Presidents of Treatment (AVP), Regional Directors and BCBAs, BTs and ABTs who have direct experience with the type of case in question, graduate students, and, as needed, a psychologist or speech-language pathologist. So, what happens at an RRT meeting now that we know who’s going to be there? Well, there are many components to the RRT meeting. First, the therapist who submitted the case provides a client summary. This includes basic background information such as the child’s age, any relevant health issues, family composition, level of services and service setting. Next is a description of the existing concern from both the therapist and the family’s perspective. This includes the specific problem behavior, status of progress achieved, and the barriers to attainment of progress. Plans and interventions currently being used to address the issue are presented in detail. Client data is provided (baseline and upon treatment), scholarly articles and research reviews are discussed, and a thorough and exhaustive “meeting of the minds” ensues. At the conclusion of the meeting, a summary of recommendations is made for the direct staff on the case and the supervising BCBA. This might include additional intervention, data collection and assessment, or a referral(s) for additional support or specialty services. Examples might include: skill programs to be added or altered, changes in reinforcement procedures, or changes in intensity of services. Regardless, a follow-up meeting to review the status of the case is made to determine whether additional discussion is required, or, improvement has been achieved. Ethics is always a consideration, and potential conflicts between Beacon staff, other external providers, and family and caregivers are also addressed should they come up. In short, the RRT meeting is a supportive, professional forum that encourages the exchange of ideas which we hope will lead to better outcomes for the children and families we work with. It is our promise to you that we will do all we can for your family. © 2019 Beacon ABA Services, All Rights Reserved. | Web Design and Hosting by Ashdown Technologies, Inc.